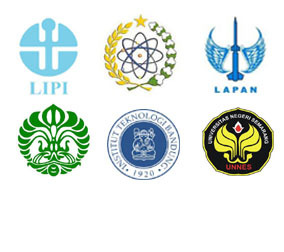 Plastic resins are composed of a range of polymer types. Similarities in the size and shape of the resins make them difficult to distinguish by sight alone. In this application note, near infrared (NIR) spectroscopy is used to sort colored resins composed of different polymers. Diffuse reflection measurements are made in the NIR region to capture distinct spectral differences resulting from the unique polymer compositions, while avoiding the detection of spectral differences arising from resin color. 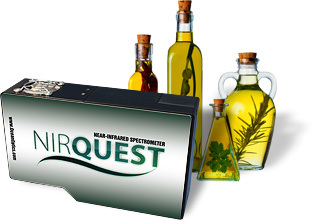 With the ability to provide non-destructive, rapid analysis with little to no sample preparation, NIR spectroscopy is used for diverse applications ranging from measurement of oxygen in blood to the detection of fuel adulteration to quality control of agricultural products. 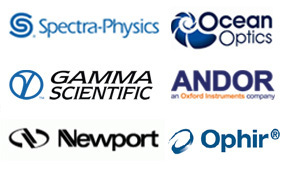 When combined with multivariate calibration techniques, a single NIR spectrum can provide quantitative compositional information on multiple sample components. Polymers used in plastics have unique NIR spectral fingerprints that can be used for sorting and quality assurance throughout the life of the material. NIR spectroscopy can be used to sort and identify polymer resins prior to extrusion and later for rapid sorting of the product at recycling facilities. In this application note, the use of NIR spectroscopy for distinguishing colored plastic resins is described. Diffuse reflection measurements were made using an NIR spectrometer with a 512-element InGaAs detector array in the region from 900-1700 nm (NIRQuest512-1.7). The setup also included a tungsten halogen source for illumination (HL-2000), a 400 µm fiber optic reflection probe (QR400-7-VIS-NIR) positioned at 45° for sample collection using a reflection probe holder (RPH-1) and a diffuse reflection standard (WS-1). Seven resins varying in color and polymer composition were measured. Four acrylic resins (clear, orange, red and translucent), two polypropylene resins (black and white) and one nylon resin were measured. To provide representative spectral data and account for the non-uniformity of the samples, six spectra were measured at different locations on each resin sample with the average shown in the figures below. 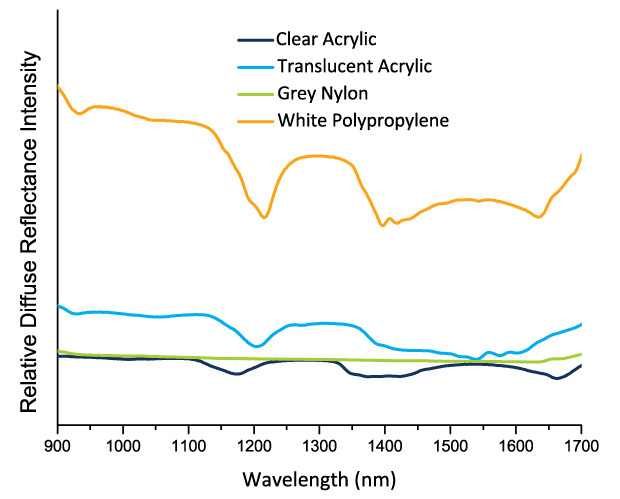 As shown in Figure 1, NIR diffuse reflection measurements can be used to distinguish the three polymer types (acrylic, polypropylene and nylon). Spectral differences were also observed for shiny-clear and matte-translucent acrylic resins. Spectral differences like these could be used for the sorting of inbound raw materials or for sorting recycled plastics. Figure 1. NIR diffuse reflection spectra acquired from polymer resins reveal differences based on chemical composition and surface characteristics. Figure 2. Spectral data for lighter colored plastic resins acquired in the NIR region reveal differences independent of color characteristics. 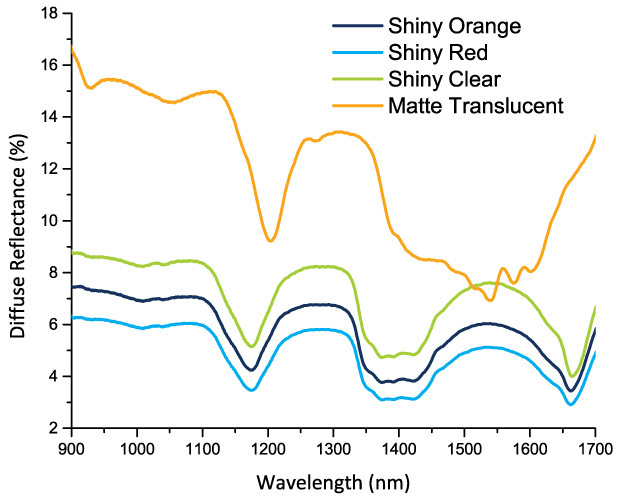 The spectral data for different colored shiny acrylic resins are shown in Figure 2. While some slight differences in reflection intensity are observed, the overall shape of spectra in the NIR region do not change with variation in color for the lightest resin colors. As shown in these spectra, spectral data for lighter colored plastic resins acquired in this NIR region are independent of color. These spectra illustrate the advantage of using NIR wavelengths for plastic sorting based on polymer type, regardless of resin color. While the shiny, lighter colored acrylic resins are similar in shape, the matte surface of the translucent acrylic resin had the highest diffuse reflection and revealed some unique spectral features. The less shiny resins reflect more light at 45° than the shiny resins, which have higher specular reflection at 90°. The data for matte versus shiny resins illustrate that NIR reflection spectroscopy is a viable tool for determining the gloss or shine at the surface of the resin. While the lighter colors do not significantly impact the shape of the NIR diffuse reflection spectra, the lowest diffuse reflection is observed from the shiny, red acrylic resin that was the darkest of the acrylic resins. You can observe how the darker color decreased the diffuse reflection intensity and flattened the spectral features. Figure 3: NIR-based sorting methods are not as effective with darker color samples, which absorb more of the NIR light. 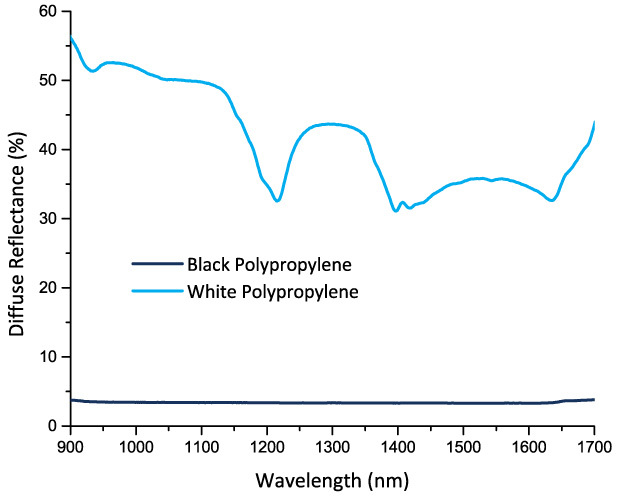 The impact of darker colors on the diffuse reflection spectrum is also shown in Figure 3 for black and white polypropylene. As shown by the significant differences in diffuse reflection intensity, black or dark colored samples that absorb NIR light result in lower reflection intensity and loss of spectral features. For this reason, darker resin and plastic samples provide a challenge for NIR based sorting methods. As illustrated by the spectral data for the different polymer resins, NIR spectroscopy measurements can be applied for sorting, identification and quality control at many stages throughout the plastic lifecycle. NIR spectroscopy can be used to confirm the identity and quality of inbound resins. This provides useful data for analysis of the resins and extruded product to confirm proper product composition and as a quality control measurement for the final product. When the plastics are recycled, NIR spectroscopy can be used to sort the recycled plastics into various polymer types so they can be reused in other plastic products.